Hello Blog Friends! I can't believe it's been a whole week since I posted. I have been playing catch up and the cards I've made have been flying out by mail before I could snap a photo! As you can see, I am LOVING this Chevron Embossing Folder! It is perfect for guys and for Halloween, too! My elements are a simple circle with stars and a banner with the birthday sentiment. I love it! This card came together very quickly. I took most of the colors from this lovely ribbon on the kraft paper-wrapped package! Thank you for looking and I hope you will leave your comments below! Don't forget to visit my PROMOTIONS page to learn about all of the wonderful ways to benefit while using Stampin' Up's quality products. 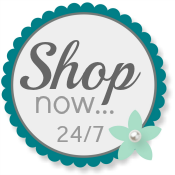 For all of your purchases, please visit my Website. Your order will ship right to your door. I thank all of you for your recent online orders! You are making my day! I love this card. the colors and placement of the stars are perfect.